Imagine a photovoltaic cell or module that actually stores as well as produces energy, acting as a battery and producing power even after dark. New research into silicon-based supercapacitors at Vanderbilt University shows that it’s possible. Starbucks and top-tier U.S. solar developer Cypress Creek on Monday unveiled a partnership on eight Texas solar projects that will provide energy to 360 Starbucks stores across the state. In total, the coffee company’s offtake accounts for 70 megawatts from eight Cypress Creek-owned projects. A division of U.S. Bank, the U.S. Bancorp Community Development Corporation, helped facilitate the deal and provided some tax equity for the projects. The bank previously worked with Starbucks on a 47-megawatt North Carolina solar project to power 600 stores. Analysts say the transaction indicates the growing sophistication of corporate and industrial offtake deals, as customers — including those beyond the big tech buyers like Apple and Google — become more adept at navigating renewables purchases. Chris Roetheli, business development officer at the U.S. Bancorp Community Development Corporation, also noted the novelty of the deal. The deal with Cypress Creek in Texas follows a similar one for Starbucks late last year in Illinois, with the coffee giant contracting for 14 megawatts of wind power with electricity retailer Constellation, which in turn is buying the power from developer Enel Green Power. More and more companies are jumping on the C&I bandwagon, driven by both the favorable economics and to pursue the “environmental leadership” cited by Rebecca Zimmer, Starbucks' director of global environmental impact, in announcing the deal. Though Facebook, Google and Amazon account for a cumulative 35.1 percent of the U.S. C&I market, according to Wood Mackenzie Power & Renewables, 119 corporations have now signed wind and solar offtake agreements across the country. The Business Renewables Center at the Rocky Mountain Institute tracked 6.53 gigawatts' worth of U.S. projects announced in 2018, a significant jump from the 2.78 gigawatts in 2017. According to WoodMac, Texas’ cheap wind and solar resources has helped it rank among the top states for the siting of corporate deals. It has over 1,000 megawatts of corporate-linked renewables in operation or in development. Smith said the particulars of the Starbucks-Cypress Creek deal should be replicable in other areas. The two companies worked with Engie Resources on “a simple retail energy supply contract” and a brand-name bank to help with financing. “Working with a retail energy supplier helps them navigate the problem of buying that much power across a big area of Texas. The interesting part is that they invested tax-equity in the projects as well,” said Smith. At the Clinton Global Initiative in Denver this week more than 20 companies announced they will support the adoption of the truSolar Initiative’s standards. 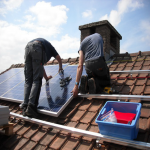 The standards offer the solar industry a uniform risk assessment methodology.